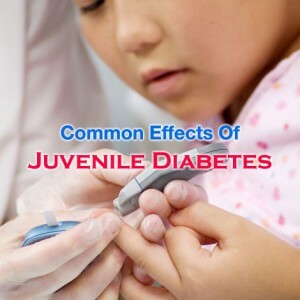 Effects of Juvenile diabetes can be easily controlled by maintaining proper blood sugar levels. Juvenile diabetes can be easily managed with help of few lifestyle changes such as maintaining proper diet, through exercising, and through insulin therapy. Juvenile diabetes is also known as Type 1 Diabetes, T1D, Diabetes mellitus type 1, and insulin dependent diabetes. Insulin in our body is produced by beta-cells in pancreas. This type is diabetes is caused when our auto-immune system destructs these beta-cells. This disease can have certain long-term effects on the human body due to the fact that it affects several organs. Blood vessel and heart damage include stroke, heart attack, atherosclerosis, high blood pressure and coronary artery disease. It has been stated by the American Diabetes Association that around 65% of the people suffering from juvenile diabetes die due to heart complications. Neuropathy is a condition where the nerves get damaged. Neuropathy caused due to juvenile diabetes results in tingling, numbness or burning in the arms, legs, feet and hands and weakness. Diabetic neuropathy takes a toll on the health of over 60% people suffering from juvenile diabetes. Retinopathy is a condition where the light sensitive layer of tissue called the retina located at the rear side of the eye gets damaged. The blood vessels within the retina get leaky or blocked and start growing haphazardly. The levels of blood sugar need to be controlled in order to lower the chances of developing eye problems. One of the major Effects of Juvenile Diabetes in people is kidney disease. This is caused due to the small blood vessels of the kidney getting leaky or blocked resulting in lowering the work efficiency of the kidneys. The nerves in the foot area tend to get damaged in people suffering from juvenile diabetes. These foot problems like small cuts and nicks that go unnoticed can develop into foot ulcers.